For those with older iMacs and Power Macs that didn't ship with Apple's new Pro Keyboard, finding a good extended keyboard has often been a priority. Apple's USB keyboard just didn't have the layout power users needed, let alone all the keys needed when running a Windows emulator. We've been buying the Macally iKey at work for nearly a year. It was the first USB keyboard we found with the same key layout as Apple's extended keyboard - something crucial when supporting a mix of users, some with ADB extended keyboards and others on USB Macs. The Macally is a nice keyboard, but it had some problems with mouse freezes (which apparently are being resolved). I never ran into that problem, but reports were fairly widespread. The iKey is also as big as Apple's old extended keyboard, making it one of the larger keyboards on the market. The Macsense keyboard is slightly narrower and about 0.7" less deep. Because of the way the color is moulded around the keyboard, it looks even smaller. This is purely subjective, but the Macsense keyboard feels more robust, most solid, more substantial than the Macally. Having used both, I prefer typing on the Macsense keyboard, although it is a bit more "clacky" sounding. 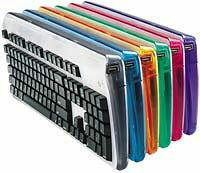 (Eric Prentice of Dr Bott LLC, a Macsense distributor, says some users prefer a clackier keyboard.) As someone who types a lot, I really enjoy this keyboard. The UKB-600 has rounded off edges, a real contrast to the iKey and most keyboards except for Apple's small USB keyboard. The frosted plastic looks cleaner and less transparent than the Macally's, which looks cheap in comparison. Truth be told, I've had a Macsense keyboard for over a month, but didn't want to write a bad review. My first sample had one glaring defect: it would spontaneously put my mouse to sleep. Unplugging the mouse and reconnecting it didn't solve the problem. (I can't plug the mouse into the computer, because I use a MoniSwitch USB to share on mouse, monitor, and keyboard between two Power Macs at work.) I usually had to reboot. Dr Bott checked, found there had been a bad batch, and sent me a replacement, which arrived while I was a Macweek Expo last week. I'm impressed with the customer support, not just the keyboard. I haven't had a chance to sit down and work with Apple's new Pro Keyboard yet, but of all the USB keyboards I've used to date, the Macsense is the best. The Macsense keyboard is avaiable in any of the old iMac flavors from Dr Bott LLC, Outpost.com, MacMall, and other vendors for about US$50.